As the cooler weather settles in and I begin to adjust to the deliriously early hours of a baker's life I've come to appreciate more and more the comforts of having breakfast at home. To potter about aimlessly, somewhat dishevelled and unkempt. To pause idly over the steam swirling up from my cup, idly window gazing as the uncounted minutes pass. No place to be, no rush to be had. It's a glorious—albeit rare—luxury, but to make the most of these infrequent leisurely starts, breakfast must also be just that. No complicated fry-up with countless components and the dishes to match, just the simplicity of a warm bowl of porridge, possibly a pastry, or the old and ever-splendid favourite, a thick-cut slab of toast. In my perpetual search for tasty breakfasts I came across this recipe for honey oat bread and thought it the perfect happy medium; a nice crusty loaf lightened by the warmth of oatmeal and a subtle, honey sweetness. Fresh from the oven this loaf is a delight and I believe devouring it just-warm is best, although it does toast well should you prefer your breakfast bread crisp. The loaf also keeps, so if you'd rather bake ahead on the day it needs little more than a quick reheat as you gather any preferred condiments to the ready. On a handling note the dough is quite wet, so if you're kneading by hand don't fret. It will come together eventually, I promise, and it's important not to add extra flour early on if you wish to avoid an unpleasingly dry loaf (the oat flour continues to soak up the moisture as the dough proves so you need to keep the hydration up). A comforting combination, and one I sense could pair equally well with either savoury or sweet. Much like the subtle sweetness of cornbread—which lends itself both ways—I'd wager the honey oat loaf could easily make friends with some salty bacon and relish, but today bread, jam and black coffee is everything and all that I need. In a large bowl mix together the milk, water and yeast and let sit in a warm place for 10 minutes until activated and frothy. Add the honey, butter and salt, and then then gradually mix in the oat, bread and spelt flours until the dough comes together. Turn the dough out onto a lightly-oiled surface and knead for 7-10 minutes until it becomes smooth and elastic. Return to a lightly-oiled bowl and leave, covered, in a warm place for 1.5-2 hours until it has come up in size by half*. 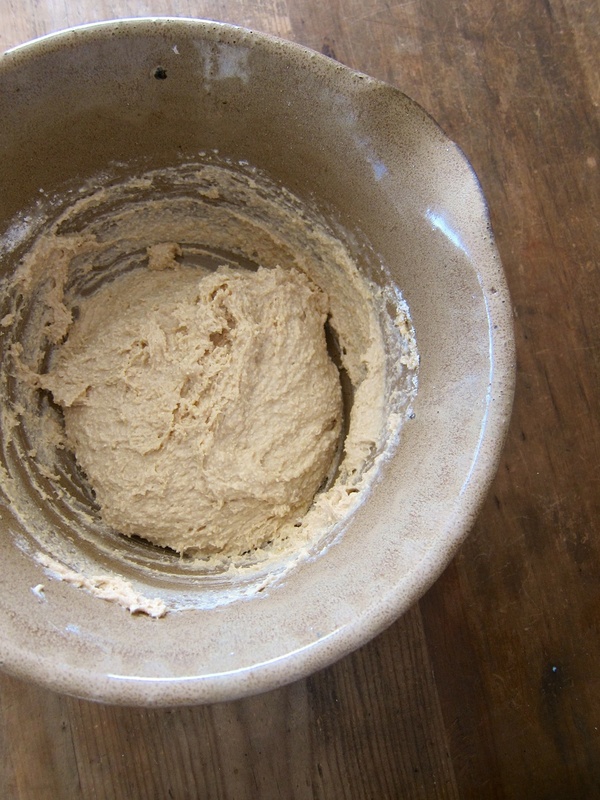 Once risen turn the dough out, kneading gently, and then shape into an even log and place in a greased 9"×5" loaf pan. Cover and leave in a warm place for another 40-60 minutes until risen by half again. Pre-heat the oven to 180°C. Brush the loaf with warm honey, sprinkle with oat flakes and then bake for 45-60 minutes until the surface is golden brown and the loaf sounds hollow when tapped. Remove from the pan and allow the bread to cool slightly before slicing. Serve with copious amounts of butter and jam. ** To make the oat flour, process whole oats for 2-3 minutes until the mixture resembles whole wheat flour. ** "Risen by half again" is how I describe the increase in dough volume that would traditionally be termed "until doubled in size".